Sardonyx is a variety of onyx. The name sardonyx derives from the word “Sard” and “Onyx” relating to the striped or banded appearance of layers of white, grey or black interspersed with reddish brown. The ancient Greeks and Romans were very fond of sardonyx and believed it could bring courage and victory. 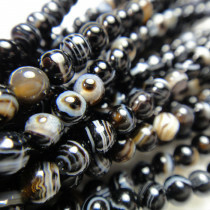 Brazilian Black Sardonyx Round 4mm Gemstone Beads (~100pce Strand) - 40cm/16'" Strand. 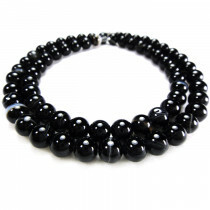 Brazilian Black Sardonyx Round 6mm Gemstone Beads (66pce Strand) - 40cm/16'" Strand. 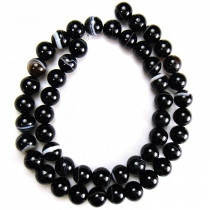 Brazilian Black Sardonyx Round 8mm Gemstone Beads (~50pce Strand) - 40cm/16'" Strand. 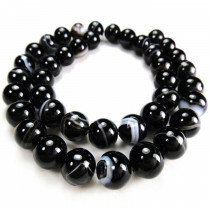 Brazilian Black Sardonyx Round 10mm Gemstone Beads (~40pce Strand) - 40cm/16'" Strand. 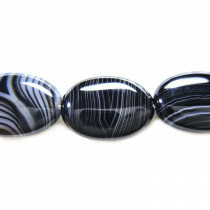 Brazilian Black Sardonyx Oval 13x18mm Gemstone Beads (22pce Strand) - 40cm/16'" Strand.